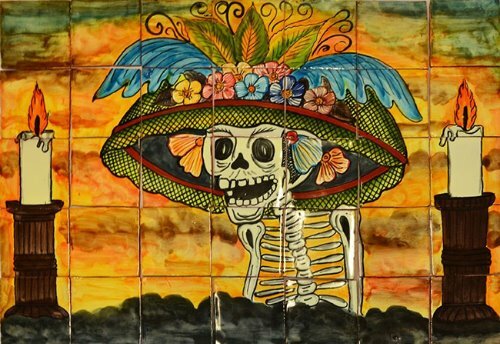 Handmade Beautiful Catrina kitchen tile mural for decorating a backsplash and walls. Those terra cotta tiles were made by artisans in central Mexico with using white, brown and black paint on a yellow background. This handmade kitchen tile mural is available painted on 4x4 or 6x6 talavera tiles and free delivery to Mexico, and the US.